This page is about the Russian jet fighter MiG-19PT. For other uses, see MiG-19S (Germany). 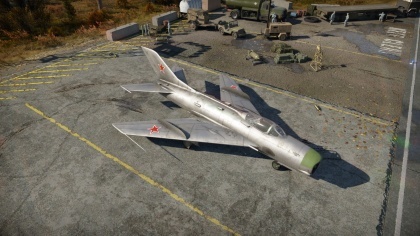 The MiG-19PT is a Rank VI Soviet jet fighter with a battle rating of 10.0 (AB/RB/SB). 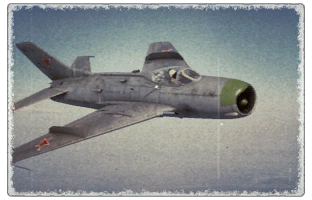 This aircraft was introduced in Update 1.85 "Supersonic" and was one of the first three jets to feature guided air-to-air missiles, the other two being the F-100D and the Javelin F.(A.W.) Mk.9. The MiG-19PT is the top-rank aircraft in the Soviet fighter line-up. ? ? 16 000 ??.? ??.? ??.? ??.? ??? 1 260 577 500 ~?? ~? The MiG-19PT is equipped with a RP-5 search and tracking radar. One radar antenna is located in the centre of the air intake, while the other (and the main body of the radar) is located in the nose of the aircraft, above the intake.